It is an exciting time. You’ve waited your whole life to get behind the wheel of a vehicle and experience that freedom and independence that a driver’s permit can provide. This is also a time when you begin to better understand laws, rules, and regulations. You see, while it is not a complicated process, there are steps that must be taken and driver’s ed requirements that must be met to successfully acquire your driver’s license. The good news is that you have found a place that can help you move through the process smoothly. This is the home of an innovative and entertaining driver’s education course. We are Driver License Direct by Improv. The Improv is a world famous Comedy Club that has brought its entertaining approach to what could be a mundane course. Our online driver’s ed classes are fun, entertaining, and easy to complete! Drivers must be at least 15 ½ years of age. Some states allow training to begin at 15. Candidates must pass a written permit test along with a vision test. They will need to pay associated fees. When you have acquired your learner's permit, the real learning begins. 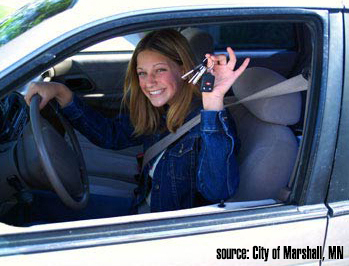 You will need to spend a designated amount of hours behind the wheel with a licensed driver serving as a supervisor. This is an important part of your driver’s education for it is where you will get the hands on experience that will ultimately make you a better driver. We told you that you would learn about rules and regulations, and there are a few associated with your learner’s permit. You will likely be limited to driving during daylight hours and you may only get behind the wheel when there is a licensed, supervising adult is in the car. You will find there are restrictions associated with both the learner’s permit and ultimately, your first-time driver’s license. Congratulations! You are now a licensed driver! For more detailed information on these requirements including information about Parent Taught Driver’s Ed and our online driver education course click on your specific state. Learn more about why DRIVER LICENSE DIRECT BY IMPROV should be your choice for online driver’s ed.Getting started is easy! Simply sign up for your driver’s ed classes online!